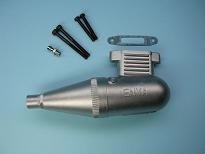 We are developed a new range of F2B silencers to use in all kinds of engines. This silencers will mount bafle to reduce noise. Will be made in two sizes; up to .25 engines and .25 to 61 engines. We will insert photo and technical data soon. Tongue muffler only 25 grams.